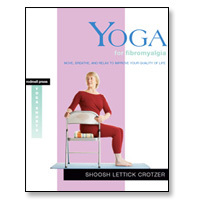 Shoosh Lettick Crotzer's Yoga for Fibromyalgia is the first yoga book devoted exclusively to managing the symptoms of this arthritis-related condition. Her comprehensive program of twenty-six illustrated yoga poses, breathing techniques, and guided visualization and relaxation sessions can be practiced regardless of age or yoga experience. She teaches how to use simple props—a chair, a blanket—to modify poses to support your body and your changing needs, and suggests how to use each pose to ease the effects of daily activities, such as sitting, driving, and gardening. The poses are modeled by yoga teacher Deirdre Carrigan who has fibromyalgia. The Living with Fibromyalgia section discusses lifestyle concerns, such as sleep, nutrition, exercise, and managing daily movement. Shoosh's work is grounded in compassion, offering hope for improving quality of life. "Shoosh Lettick Crotzer has written a wonderful guide for women with fibromyalgia. It is not only clear that she understands the health issues of patients, but also clear that she understands the benefits of empowering women to take charge of their health. I love the emphasis on how to apply principles of yoga to everyday life. This book is packed with practical advice and I will recommend it to my patients." "Shoosh is a healer. She shares techniques and gifted insights honed and focused for a lifetime. In Yoga for Fibromyalgia, she gives practical ways to relieve pain, improve mobility, and restore health. Share it with a loved one in need." "This book offers clear and relevant yoga and lifestyle information to those suffering from fibromyalgia. But it offers something even more important: hope that things can get better. Highly recommended for yoga teachers, for experienced yoga students, and for those people just beginning to practice." "Shoosh Lettick Crotzer understands that most people with fibromyalgia can benefit from a gentle approach to yoga. In this book, she teaches a variety of helpful poses and visualization techniques; suggests practice routines to meet your changing needs; and, most important for healing, guides you toward making yoga part of your everyday life." "This book is an inviting introduction to yoga for fibromyalgia sufferers. With a well-considered series of gentle stretches and breathing and relaxation exercises, this program is beneficial even for more debilitated beginners and forms a foundation for those students ready to move on to other active yoga poses." "Ms. Crotzer's breathing and awareness techniques are excellent for increasing focus and mental clarity, which facilitate coping not only with fibromyalgia but also with general stress. She has done a terrific job of adapting traditional yoga poses, some of which can be done in a chair. And the book's instructions and photos make the poses easy to follow. I particularly like the sections called "Everyday Yoga" (at the end of each pose), which give examples of how to use the poses throughout the day. Her yoga sequences can clearly help people with fibromyalgia in a way that is gentle and does not cause pain."